Spring has sprung, the kids are outside running around, and then they are inside. You are out of traversing around in your favorite shoes, walking more, having fun. There is nothing like a Spring day, the sun is shining, the birds are singing, the sky is pitch perfect blue and all you want to do is walk. You might be out shopping, walking through parking lots, walking in stores, just walking everywhere because that is what this weather is meant for. What we really don’t want is the dirt that is attracted to the soles of our shoes coming into our homes because often this dirt and debris also is accompanied by germs, bacteria, sometimes stains, sometimes gum and who knows what else comes in on the bottom of shoes. As you all know I am so obsessive compulsive about things, and this is something that I learned that makes me calm and happy when I think about the shoes and my floors! Lavishly living life out loud would be shoes to keep your floors clean. Is there such a thing as shoes to keep your floors clean I know about some. Whether it’s those Adam Tucker, Acorn, On The Anna, Antelope, Sperry, Brookes, Bostonian, Calvin Klein, Chooka, Clark’s, Jimmy Choo, it is not about the brand but it is what the footwear brings into the house that makes it possible to have shoes they keep your floors clean. The process is quite simple, no matter what pair of shoes you own or your children own or your mate, it is possible to keep those floors clean, germ-free. You will also find less debris and bacteria and all it takes is the simple wipe of sanitizing wipes, or a cloth with some antibacterial disinfectant like a Lysol. A habit we have all gotten use to in our home, is walking into our mudroom and moistening a rag, and then adding some cleaner to it weather is Lysol, Clorox two etc. and then wiping our shoes with it. We either walk on the rag for a quick rinse and go, or we literally take our shoes off, wipe them off, including the sides and then place them back one or in our closets so they are ready to go again. I personally prefer short cutting, so I leave a canister of disinfectant wipes by the door. When I come in, I simply take off my shoes, and utilize wipes to clean off all the dirt off the bottom of the shoe, and it makes quite a difference. Imagine cleaner carpets, walking on floors that have not been walked on by the outside. You will see a great difference if you were walking around your house with white socks and not picking up the dirt that your shoes ones left. Carpets will not become stain unless of course you have food going in there or pets going to the bathroom on them. 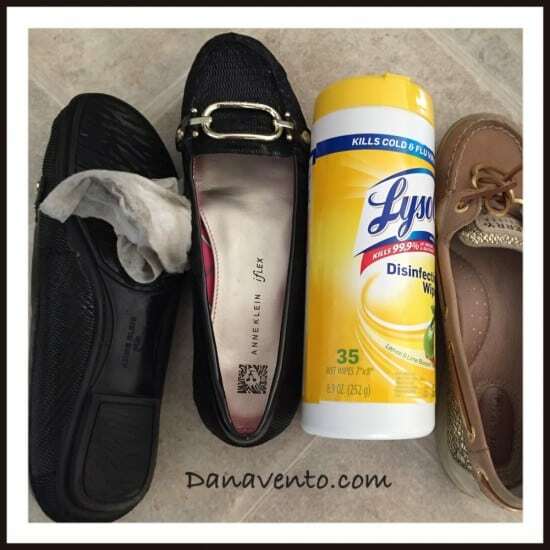 Cleaning your shoes when you walk in is a great way to keep your floors clean! Its amazing what you will track in without even noticing. Thanks for sharing!